Edward Steichen is acknowledged as one of the most significant pictorialists of the early 20th century. Along with Alfred Stieglitz, he was a founding member of the Photo-Secessionists and his work epitomises the exploration of the artistic and expressive possibilities of the photographic medium by this group. Steichen represented for Stieglitz the ideal of the ‘artist–photographer’, as one who used a formal training in art as a basis for developing a distinct photographic aesthetic. Armed from his artistic instruction with a painter’s sensibility, Steichen’s photography explored the atmospheric potential of light which was rendered as an expressive force through his impeccable technical command of the medium. Steichen first met the sculptor Auguste Rodin in 1901 when he photographed the great master at his studio in Paris. Impressed with the evocative qualities of his work, Rodin asked Steichen to photograph his sculpture of the French writer Honoré de Balzac which, rejected by its commissioning body as being too controversial a portrait, stood in its original plaster form on the grounds of Rodin’s home. Accepting Rodin’s suggestion of photographing the work against a moonlit landscape, Steichen spent two nights making numerous exposures, studying the varying effects of the night’s sky on the figure. 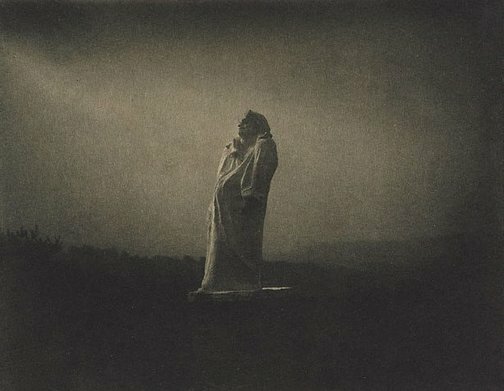 In ‘Balzac, towards the light, midnight’ Steichen powerfully re-creates the Balzac figure as a sleepless giant and a defiant presence in the expansively blackened landscape. With a symbolist’s drive for metaphor underlying his practice, Steichen aligns his sculpted subject with an image of the creative will of the sculptor himself. Denise Mimmocchi, Photography: Art Gallery of New South Wales Collection , 'International pictorialism', pg.53-69, Sydney, 2007, 52 (illus. ), 59, 63 (illus.). Alfred Stieglitz (Editor), Camera Work, no 34/35 , New York, 1911. Paths to abstraction 1867-1917 , Sydney, 2010, 101 (illus. ).